In today’s age, you’ll be hard pressed to find a brand or destination that isn’t using social media to enhance their marketing efforts. More and more consumers are going to Instagram and Facebook to get inspiration and to even plan their vacations, so it makes sense to focus efforts on these platforms. 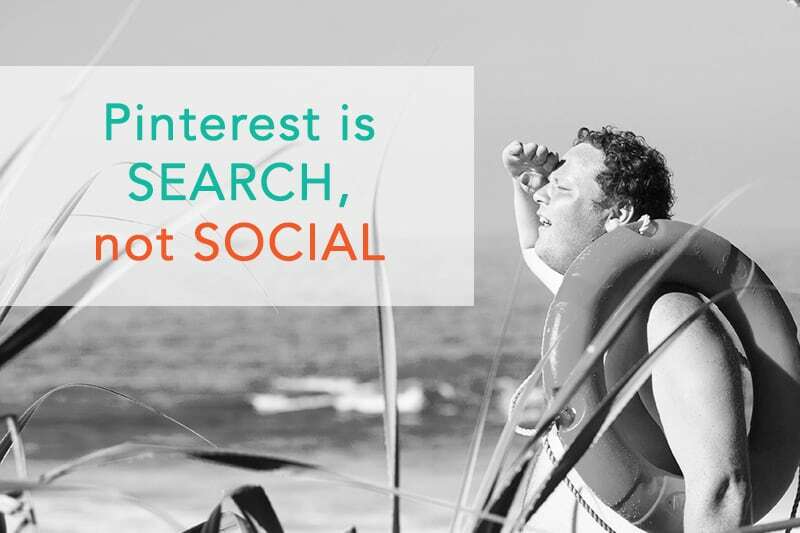 However, an often overlooked platform, that is arguably NOT a social platform, is Pinterest. Pinterest has over 175 million active monthly users, which puts it at the low end when ranking against social behemoths like Facebook and Instagram, but there are a lot of key differences between how users use Pinterest, Instagram and Facebook. Toss out the idea of Pinterest being a social platform, first of all. Pinterest is a search engine. Think of all the effort you put into optimizing your content and websites for on engines like Google – those same tactics will make you successful on Pinterest. If you’ve never stepped your virtual foot inside of Pinterest, we can paint a picture for you. It used to be a place to go searching for recipes, tattoo ideas, DIY home projects, ALL THE CRAFTS, and more. In the years since its inception, it has grown to something significantly more important and more inclusive. Pinterest has quickly carved out a unique place in the world. A place where users can go for planning, purchasing and information. 87% of Pinners say they have purchased a product because of Pinterest, can the same be said about Instagram? Wrong. 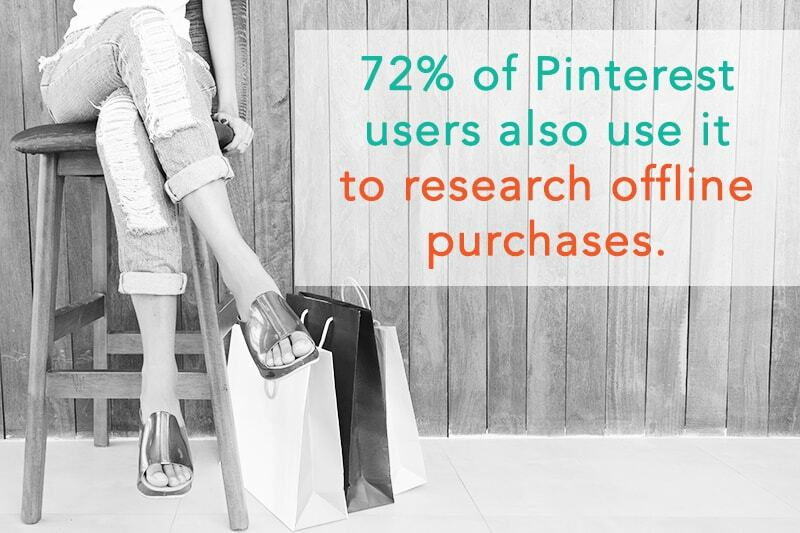 72% of Pinterest users said they use Pinterest to decide even what to buy offline. Pinterest is the perfect way to capture consumers exactly on the part of the buying cycle where you want them. With the introduction of Pinterest’s own, native, visual search tool called Lens, the platform leaped miles ahead of even Google. Users can hit a little plus sign on a “pin” and 20+ pins that have similar visual details will be brought up. Why is this important for the travel sphere? Visuals. Beautiful photography and imagery tells a captivating story in itself when it comes to travel, and Pinterest is literally opening this window for users to be able to search for more content purely based on the photo they are currently looking at. Most importantly, disposable incomes of Pinterest users are also significantly higher than those of most other platforms, half of Pinterest users’ household incomes are $50K or greater per year, and 10 percent of Pinteresting households make greater than $125K. So these users are going to Pinterest looking for information to make a purchase, AND they even take those messages offline and make purchases AND they have the incomes to do so! When you’re setting up your profile there are a few key things to keep in mind. For every one of these steps, keywords are important. A great thing to do before you even start to create your account is to set a few key keywords that you want to focus on with your Pinterest account. You’ll want to include these in as many places as possible throughout the setup process. Don’t get cute, this is an important part of your search power, include your brand name and your main keyword in your display name and use the handle you use for your other social accounts to make it consistent. Ie. “Travel Canada | Destination Canada”. Stick with one key niche. If you’re a travel brand, keep everything in that vertical. Pinterest wants the content that comes from your verified website to and the content that you pin on your account to be as closely related and quality as possible. If your account is all about traveling in Canada, then boards for each province, winter travel, packing lists for the cold, food travel in Canada all would play naturally to your main topic. The description on your profile, of each individual board and each individual pin are all places to put keywords. It’s important that they are all different each time and that they sound as human as possible. Don’t just shove keywords in with slashes between and call it a day. Every platform out there is trying to combat spam as much as possible, don’t give Pinterest a reason to think you’re being spammy. Pinterest is one of the last platforms out there that isn’t penalizing business accounts yet, take advantage of this and the key analytics that come from using a business account. 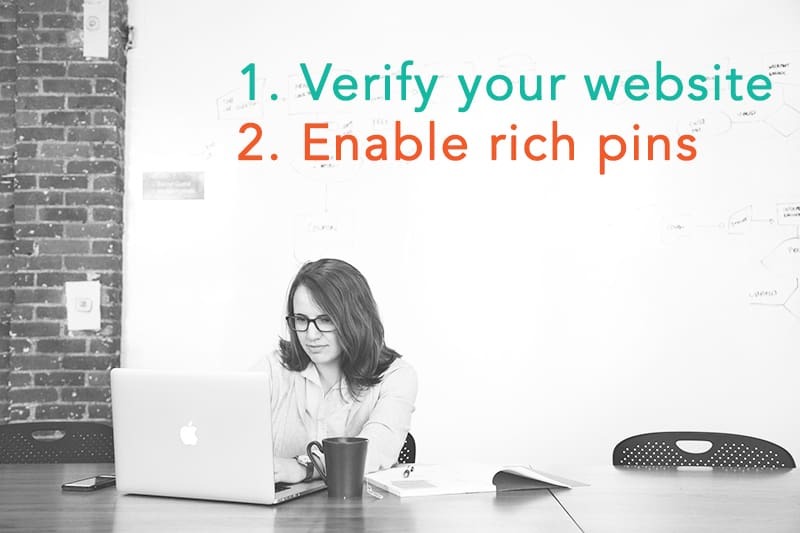 Make sure you verify your website with your account and you enable rich pins to optimize your account for success. Something to always keep at the forefront of your mind when working in Pinterest, is that it is a very visual platform. If you have a graphics team at your disposal, it would be well worth their time to put together a few pin templates for your social team to ensure that the graphics you’re putting into Pinterest are, in fact, visually appealing. Optimal pins are a 2:3 ratio and either have no text overlaying or have a small amount of text in the top third of the image explaining where the Pin will take you if you click it. We suggest trying out different colors, text lengths, fonts, no text vs text, imagery, and descriptions. Pinterest is a great place to do A/B testing to determine what works for your followers. You can make multiple pins pointing to the same blog post or page, in fact, you can make as many as you want, so make sure you’re repurposing content often. Pinterest is currently placing an emphasis on the content you own (aka the content that comes from the website you have verified on your account), so making as many pins as possible that point to your website is a great tactic! We wouldn’t be HMI if we didn’t bring it back around to how you can use content creators to enhance your Pinterest presence. When you’re considering working with content creators, vloggers and social media influencers, there are ways you can amplify your efforts utilizing Pinterest. For any blog or vlog content, you can make pins pointing to their content on your account, or ask for the creators to make pins and import them into Pinterest and then you repin them. This allows you to get reach on multiple channels with the same content. An important thing to note, do NOT take the creators’ pins and change the link or take credit for their imagery and design, unfortunately this is a rampant practice on Pinterest, and pins are still the creators’ property and your account could be damaged because of this. There are new features being introduced everyday that give you even more options for engaging new users! Currently, Pinterest allows users to upload their photos related to the pin in the comment section of the pin itself. You can see it on this pin. 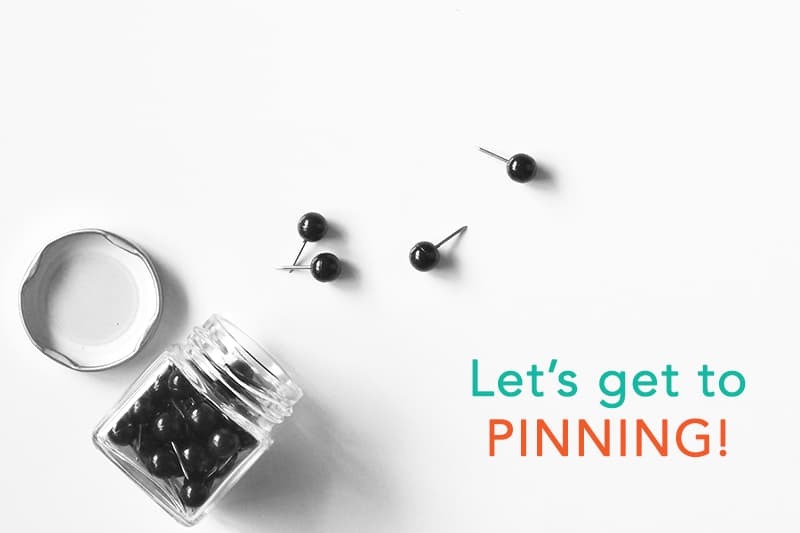 This is a great opportunity to get your audience engaged and to help give your pins a boost in the Pinterest algorithm. If you’re considering getting started on Pinterest, which after all this, we hope you are, contact us, and we can set you up for success from the start!